$70.00 Citation for winning 2nd prize in revolver shooting competition, dated 23 February 1933. $125.00 Citation to a decorated Combat Engineers Captain for participating in the liquidation of the enemy troops in the Stalingrad cauldron. 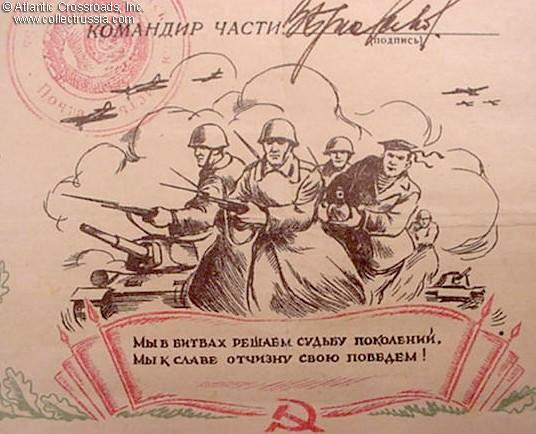 Issued at the end or immediately after the war, this unit citation is of larger format than most and features very detailed artwork depicting Soviet combat engineers in action. Shows a stamp of very illustrious mountain combat engineers battalion. In excellent condition. Includes copies of the recipient's recommendations for three wartime orders - including a Red Star earned in Stalingrad - and a copy of large format post-war photograph in which he is shown wearing his decorations. $39.00 Citation to Guards Major for the liberation of Gomel', Ukraine 1943. $80.00 Unit Citation for Participation in the Capture of Dresden. Issued in June 1945 to a Guards Sergeant of an illustrious Guards rifle brigade in 7th Guards Tank Corps. Nice artwork depicting Soviet tank smashing a Nazi artillery piece with its tracks. Hand-signed by the unit commander. In very good condition. $44.00 Unit Citation to a sergeant for valor during the capture of Vienna	Unusual "square" format. $75.00 Citation to a Sergeant for taking part in the destruction of the German armor southwest of Budapest in March 1945 (breaking the last German offensive of the war on Lake Balaton). Uncommon booklet type certificate, in very good condition. $125.00 Lot of 2 Documents to a serviceman of 332nd Rifle Division. Includes a large, colorful retirement greeting issued on behalf of Marshal Sokolovsky, commander of the Soviet Army of Occupation in Germany, and a "cumulative" unit citation stating that the recipient participated in 10 battles in which his unit earned an honorary mentioning in Stalin decrees. $75.00 Honorary Discharge certificate issued to a sergeant of the Soviet Army of Occupation in Germany, March 1947. Large 11½" x 16½" format. Features portrait of Stalin and very attractive artwork with Kremlin, Il-2 Shturmovik airplanes, T-34 tanks and Order of Glory. Very good to excellent condition.